Mysteries of twin bridges in Danville, Indiana (originally published April 25, 2013)-We arrived at this bridge near Danville, Indiana around sunset with just enough time to get a few images of the slightly Gothic-looking span before it got too dark to photograph. Researching the story a bit more after returning home left me with more questions than answers. I'm not sure who posted a link to this story but it got a lot of traffic and comments from Danville locals. Foodie Finds: 5 Best Places to eat around Saugatuck, Michigan (originally published December 11, 2011) -This is a guest post written by Jessie Voigts of Wandering Educators. Restaurant round-ups sometimes become quickly dated as eateries come and go, but the restaurants here seem to still be in business judging from the Web and a quick check of current Yelp reviews (Su Casa's home office remains at the Saugatuck address, although there are nearby Su Casa outlets at South Haven and Holland). I love Jessie's emphasis on locally owned restaurants and deeply appreciated this post and others she did to help me keep Midwest Guest going in the wake of my dad's death in 2011. The mystery of Benzie County's Putney Road (originally published October 28, 2010) -We'd always heard about this spot in northern Michigan where it appears that your car goes uphill and backwards when you put it into neutral. We finally tested out this mystery spot because who doesn't like finding free and family-friendly attractions in a popular area like northern Michigan? Visit the Fiesta factory in Newell, West Virginia (originally published August 9, 2011) - I've always loved Fiesta dishes, and story is about our visit to the Homer Laughlin Company factory store in West Virginia. It includes a brief history of the company and the nineteenth-century pottery industry centered just across the Ohio River in East Liverpool, Ohio. 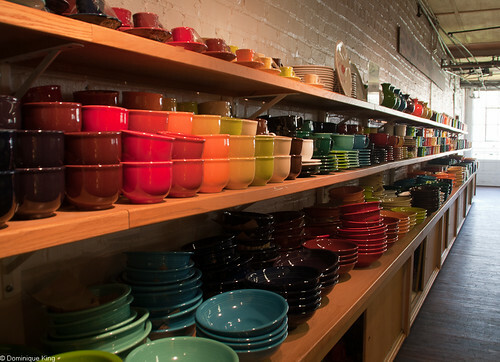 Taking the Fiesta factory tour and exploring the pottery scene East Liverpool, Ohio are on my Midwest bucket list. This story topped the most-visited list in 2012 and 2013. The mystery of Turtle Town USA: Churubusco, Indiana (originally published July 12, 2012)-This tale of Oscar, reputed to be a giant turtle weighing as much as 500 pounds that lived in a farmer's pond near this northern Indiana town, brought plenty of fame to Churubusco in the late nineteenth and early twentieth centuries. 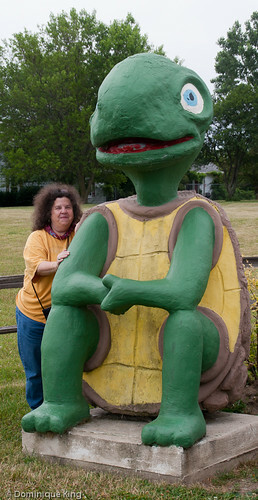 The turtle I found during my visit to the city didn't confirm or deny the story, which is the inspiration for a popular festival and the town's identity as Turtle Town USA. Canyon Falls and Gorge: The "Grand Canyon of Michigan's Upper Peninsula" (originally published June 29, 2010) -This pretty little roadside park just off of U.S. 41 near Baraga on the Sturgeon River in the Upper Peninsula features a short hike past a series of small rapids and waterfalls along the river that include the 15-foot-tall Canyon Falls and on through a canyon that is pretty impressive considering its location in a state not known for deep canyons or gorges. Michigan's Grindstone City as Grindstone Capital of the World (originally published March 22, 2011) -My dad often brought spent grinding wheels home from his shop to use as planters or flower bed borders when I was a kid, so Grindstone City in Michigan's Thumb with its ubiquitous grindstone lawn decor always held a certain fascination for me. 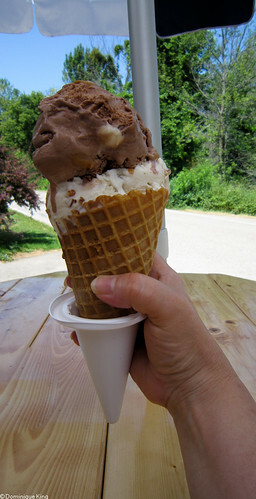 It's also worth noting that I also reported on our most recent visit the Grindstone City general store to sample the ice cream mentioned in this story as well! Photo Friday: Motown remembers Michael Jackson (originally published July 31, 2009) -I wrote this story about a Detroit memorial to the multi-talented entertainer shortly after his death in July of 2009. Even as Jackson has been gone for more than five years, interest in this story remains strong. It was the fourth most-visited Midwest Guest post in 2012, the seventh most visited story here in 2013 and still hangs in on this list as Midwest Guest's ninth most visited story in 2014. Indiana in a jar, Sechler's Pickles factory store (originally published April 30, 2009) - I've never quite figured out the appeal of this particular story about our accidental discovery of a pickle store along the highway in northern Indiana. It held the top spot for my most-visited story at Midwest Guest for a couple of years after I first wrote it. It placed at number 5 on this list for both 2012 and 2013. We re-visited the store early in 2013, the original story still sits as number 10 on the most-visited story list this year. Wondering if 2015 will be the year I'll finally newer stories place this story and my Michael Jackson story on the most-visited list! Peterson Park is local gem near Northport, Michigan (originally published October 16, 2012)-We visited this out-of-the-way park near the tip of Michigan's Leelanau Peninsula (Michigan's "little pinkie") at the suggestion of Tim's sister who lives in the area. Not many tourists know about the park, but it seems to be a favorite location for at least one area wedding photographer who posted a link to this story it from their site. The Top Ten stories for any given year seem to consist of evergreens written in prior years, so I like to include the most-read story from the present year and see if it eventually becomes an evergreen in years to come. The most popular story written this year finished just out of the Top Ten list, occupying the twelfth position on the list of most-read stories for 2014. Grand Island East Channel Lighthouse in Michigan's Pictured Rocks National Lakeshore (originally published April 24, 2014)-This weathered lighthouse in the Lake Superior harbor near Munising, Michigan is s a favorite among photographers, and one of my favorite souvenirs from this area in Michigan's Upper Peninsula is a miniature wooden snowshoe with a stained-glass insert picturing this light. The light is on private property and you can only access it via boat. Getting a closer look at this light was a highlight of a recent Pictured Rocks boat cruise for us. It's always fun to take a look at the top stories at Midwest Guest and how that list does, or doesn't, change over the years. Visit the Fiesta factory in Newell, West Virginia (originally published August 9, 2011)-I've always loved Fiesta dishes, and this is the story about our visit to the Homer Laughlin Company factory store in West Virginia. 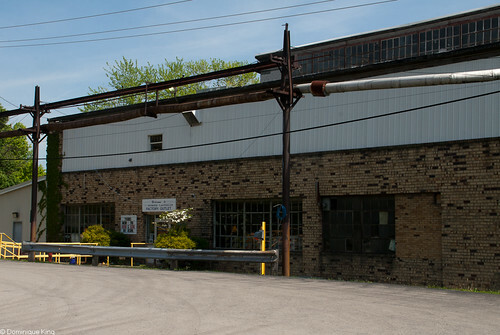 It's also a brief history of the company and the nineteenth-century pottery industry centered just across the Ohio River in East Liverpool, Ohio. Photo Friday: The Thinker ponders life in Detroit (originally published April 9, 2010)-A photo feature about a cast of Rodin's statue, The Thinker, that became one of the best-known icons of a city once known as the Paris of the West. Today, the statue sits proudly in front of the Detroit Institute of Arts. Pierce Stocking Scenic Drive at Michigan's Sleeping Bear Dunes National Lakeshore (originally published March 25, 2010)-I've done many stories about the Sleeping Bear Dunes National Lakeshore, and this feature about a scenic drive featuring sweeping views of the dunes, Lake Michigan, Glen Lake and the Manitou Islands seems to draw a lot of traffic especially as the summer months arrive and people begin planning trips Up North. Photo Friday: Motown remembers Michael Jackson (originally published July 31, 2009)-I wrote this story about a unique Detroit memorial to the multi-talented entertainer shortly after his death in July of 2009. Even as Jackson has been gone for more than three years, interest in this story remains strong. Indiana in a jar, Sechler's Pickles factory store (originally published April 30, 2009)-This story of one of our accidental discoveries along the highway in northern Indiana held the top spot for most-visited link at Midwest Guest for a couple of years after I wrote it. I'm not sure about the fascination with pickles, but I found the store pretty much the same when we visited there and replenished our supply of Sechler's Pickles a couple of months ago. 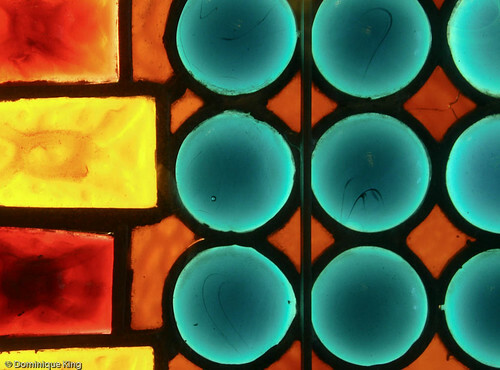 Chicago's Smith Museum of Stained Glass Windows (originally published December 17, 2009)-This was another accidental discovery we made when we visited Chicago's Navy Pier. Fans of art and Chicago's rich architectural history will find this museum tucked away between concessions, rides and boat docks along the pier worth seeking out. Indiana's University of Notre Dame embraces "Touchdown Jesus" (originally published November 23, 2010)-This is one of the Notre Dame campus' most iconic sites for football fans and fans of the school's great architecture and art. The mosaic of Christ earned its nickname because of its location on the wall directly behind the north end zone of the university's football stadium and the figure's upraised arms, reminiscent of a referee's signal for a touchdown. I also discovered that the artist who created the mosaic created a well-known mosaic in Detroit as well. Seven sensational Great Lakes National Parks (originally published April 28, 2009)-This post lists some of the Great Lakes' most beautiful and interesting National Parks. Ghosts of Punderson Manor (originally published October 28, 2008)-This story is one of my earliest posts at Midwest Guest, but it remains one of my most popular posts over the years. It still draws the occasional comment from readers relating their own paranormal Punderson experiences. Punderson was also the subject of my first post at the Ohio Tourism Division's Discovering Ohio blog (published in August of 2001), where it still draws the occasional comment from readers about their own strange and unexplained experiences at the Manor. Stories usually take a year or so the garner the cumulative traffic that puts them on my top traffic list, but here is my most visited story written and published this year. 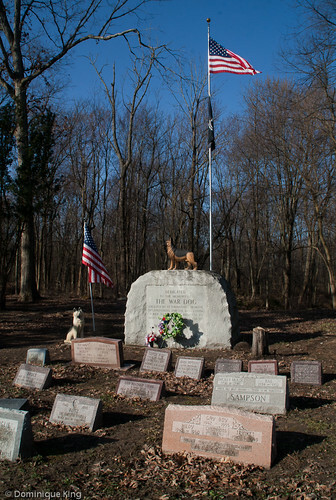 War Dog Tribute stands tall in South Lyon, Michigan (originally published March 29, 2012)-This, like a lot of my favorite stories, came about when we stumbled across something unexpectedly in our travels. This story tell the tale of a unique memorial in metro Detroit honors some of the most unsung war heroes in our country and the volunteers working to restore and respectfully maintain the site to help preserve those stories. 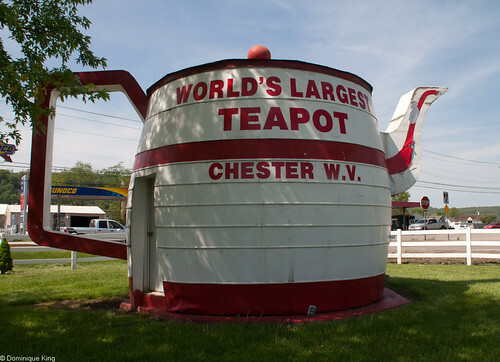 Chester, West Virginia, is mighty proud of their giant teapot. Signs around town direct visitors' attention to this landmark, and it looks as good as new thanks to the efforts of a local Eagle Scout and his friends. 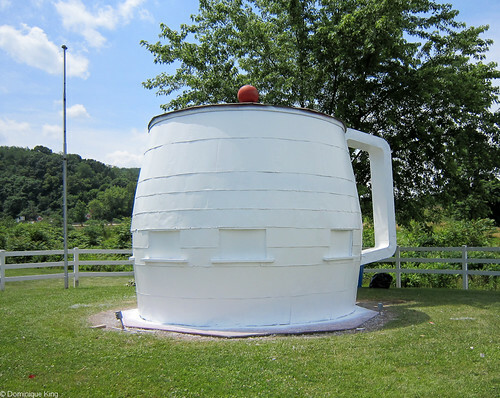 We first spotted the World's Largest Teapot this past May while exploring Ohio's leg of the Lincoln Highway. 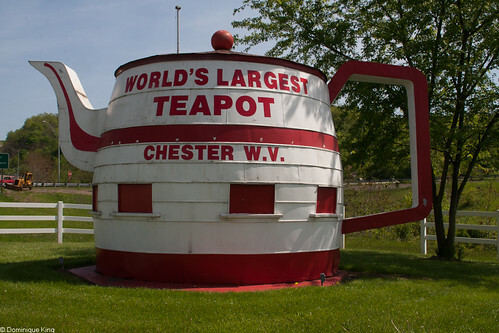 The teapot sits just over the state line in West Virginia, and when we first saw it, it looked like it needed a bit of repainting and repair. We visited Pittsburgh in June, so we decided to take the Lincoln Highway out of Pittsburgh on our way home. The route again took us through the tiny corner of West Virginia that is home to the teapot, and because there is a geocache there, we wanted to find it and check off a new state on our cache list. We found the cache and also found that Eagle Scout John "J.P." Raynor adopted the teapot as a community project, so it was in the middle of a restoration. 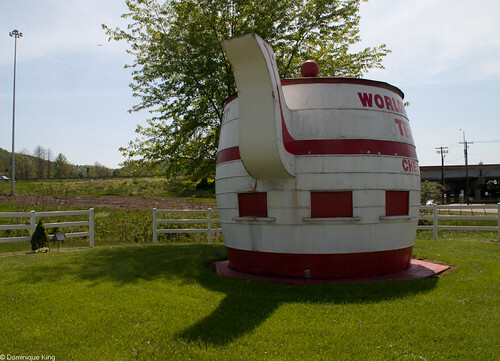 This landmark started life as a huge barrel and part of a Hire's Root Beer promotional campaign during the 1930s. Pottery merchant William "Babe" Devon bought it in 1938 and shipped it to Chester. Pottery was big business in the region, and Devon converted the barrel into a giant teapot to sit in front of his pottery outlet. Devon added a spout and handle to the barrel, covered it all in tin, painted it red and white, and finished off his creation with a large glass ball on the roof as a knob for the lid of the kettle. Devon also hired some local kids to run a food concession and souvenir stand from the 14-foot tall, 14-foot diameter structure. During World War II, gas rationing caused a decrease in traffic and decline in the pottery business, so Devon closed the teapot. In 1947, Devon sold his business with the teapot to Mary Wucherer and Rhonda Cain. They operated the teapot as a concession stand until it became too costly in the late 1960s, but continued to sell lawn and garden gifts from the building for a few more years. Cecil and Alice Fletcher bought the business and teapot in 1971, painting the landmark pot blue and white and continuing to sell pottery and other gifts from the little building until closing down the business. By 1984, the teapot sat abandoned and a local telephone company bought the site. The phone company razed the larger building that housed the main pottery businesses and considered demolishing the teapot as well. Local residents rallied to save the teapot, getting voters in the city of Chester to approve its restoration and raising $3,000 to do the work. The phone company offered to donate the structure to the town. 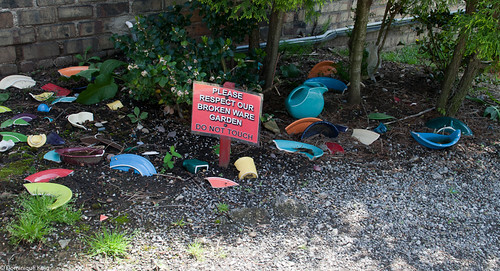 The teapot moved around Chester as debate raged over where to permanently locate it. Bad weather continued to take its toll on the teapot's condition. 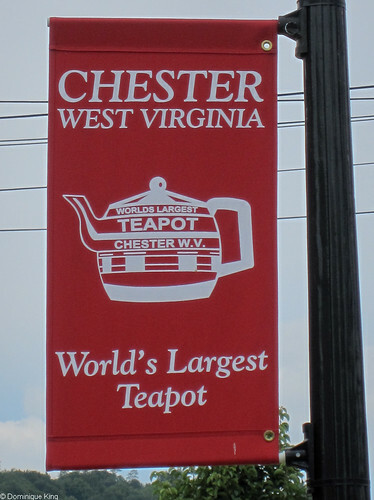 In 1990, Chester's City Council approved additional money for the teapot restoration and relocated it at a high-traffic corner at the junction of State Route 2 and U.S. 30, the current route of the classic Lincoln Highway and a part of the popular Rock Springs amusement park from 1897 until 1970. Restoration continued through 1990, replacing the deteriorating parts with more durable materials and repainting the teapot in its original red-and-white color scheme. Workers sealed and reframed the doors and windows from the concession-stand era. The teapot got a new spout and handle, a painted basketball "knob" to replace the long-lost glass finial, and a fenced, landscaped space. There were occasional efforts to repair and repaint the landmark throughout recent years. It underwent a major restoration in 2007 as part of the Hampton Hotels Save-A-Landmark program when 15 volunteers rehabbed the teapot and Hampton Hotels donated money to help fund future repair and restoration efforts. In early 2011, Eagle Scout John Raynor attended a town meeting while earning a communications merit badge. He learned that the teapot needed repair and repainting, so he adopted it as a community service project, enlisting his mom, fellow scouts and friends to help. 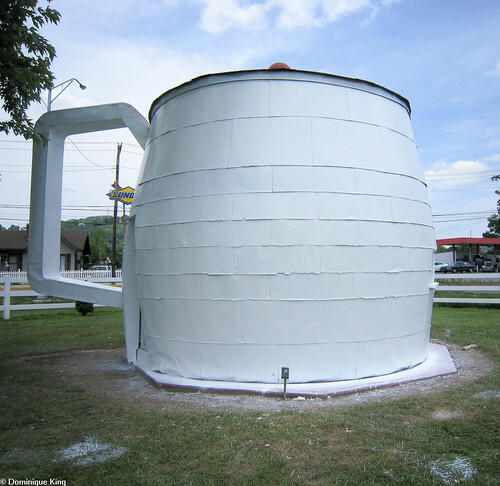 We happened to stop by to find the geocache mid-way through the most recent restoration, when I took photos of the teapot missing its spout and sporting an all-white primer coat of paint. Raynor and his crew completed the work by July. You can see a couple of photos of the completed project in the photo gallery for the cache. I wrote a bit about pottery history in this region in Visit the Fiesta factory in Newell, West Virginia. You can also learn more about the history of pottery making in Ohio Valley towns like Chester by checking out Ohio Valley Pottery Towns by Pamela Lee Gray. Check out Rock Springs Park by Joseph A. Comm to learn about the defunct amusement park that formerly occupied the teapot's current site. I’ve always loved Fiesta dishes, so you know when I discovered that the Homer Laughlin Company has its factory near the Lincoln Highway in Newell, West Virginia, and just across the Ohio River from East Liverpool, Ohio, we’d be slipping across the state line to check it out. Visitors can tour the factory, but we were not there at the right time to do so. The company conducts two factory tours each week day, and you must reserve your place for the hour-long tour in advance. Fortunately, there was still plenty to see at the factory’s retail outlet. I picked up a set of soup bowls and a 75th Fiesta anniversary T-shirt in the main store, but it was also fun rummaging in Seconds Warehouse, where shoppers can find discontinued colors, odd pieces, and strange shaped Fiesta plates, bowls and serving pieces at discount prices. Homer Laughlin Company started long before its introduction of Fiesta, though. The abundance of clay from the Ohio River resulted in pottery making becoming a major industry in area as early as the 1840s. Consumers began buying white ware imported from England by 1870, seeing it as more sophisticated than the pottery produced locally, so the East Liverpool City Council offered $5,000 in seed money for the best proposal to build and operate a factory that could manufacture white ware with local clay and workers. Brothers Homer and Shakespeare Laughlin from Liverpool, Ohio, submitted the winning bid and began selling pottery manufactured in their hometown in 1871. Shakespeare went on to other things by 1877, but Homer continued to manufacture pottery and run the company that bears his name today. Homer retired and sold the business to William Wells and Louis Aaron in 1897. Fourth- and fifth-generation members of their families continue to own and operate it today. The need for expansion in the early 1900s sparked the purchase of land across the river in Newell, West Virginia, and the company moved its headquarters there. By 1907, Homer Laughlin Company had one of the largest pottery plants in the world, with a production capacity of 300,000 pieces of pottery per day (or ten percent of the production capacity of the entire United States). The development of continuous firing kilns revolutionized the pottery industry in the 1920s. Conventional kilns required several weeks to load, fire, cool, and empty it by hand. The new, higher capacity kilns greatly speeded up the process. In 1927, Homer Laughlin hired an English potter named Frederick Hurton Rhead as its art director. Consumers still purchased dinnerware as matched sets decorated with decaled designs, much as they had since the late 1800s and very early 1900s. Rhead’s revolutionary design for Fiesta dishes and the line’s introduction in 1936 changed that. Fiesta’s concentric circles around the plates’ outer edges framed the food, and the design allowed for maximum plating surface. It was also Rhead’s idea to market Fiesta as open stock and encourage customers to mix Fiesta’s five original colors (red, cobalt blue, light green, deep golden, and cream) within place settings. Fiesta seemed radically different and modern with its sleek Deco-influenced design and vibrant colors. 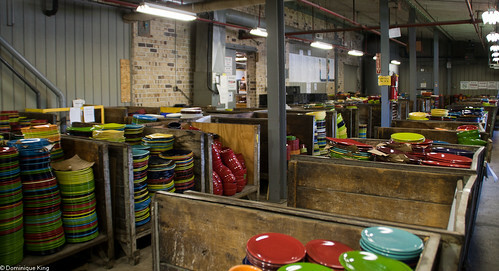 Other companies produced solid-color dinnerware, but Fiesta was the first mass-produced and widely marketed solid-color dinnerware. Its affordability made it an immediate retail success despite the Depression-era economy. World War II brought important changes to the company and its Fiesta line. Fiesta’s original red glaze contained detectable amounts of uranium oxide, and the United States’ need for that element for development of the atom bomb meant it was no longer available as an ingredient for dinnerware glazes (which is probably a good thing!). The Homer Laughlin Company began making a lot of china for the armed forces during the 1940s and increased its emphasis on commercial dinnerware for hotels and restaurants as the market for consumer dinnerware weakened. The company’s production peaked in 1948 when more than 3,000 workers produced over 10 million pieces of pottery. However, changing styles and increasing popularity of imported dinnerware in the 1950s caused a slump in sales. The company discontinued the declining Fiesta line in 1973. I always loved the clean Art Deco-style and bright colors of Fiesta dishes, wishing I could have a set of them for my own house, but I only found them in garage sales or at antique stores as I was growing up. Fiesta became very popular among collectors almost immediately after the company discontinued production and prices skyrocketed for vintage pieces. Homer Laughlin officials noted the success of Fiesta in secondary markets and decided to reintroduce it with lead-free glazes 1986 to celebrate the fiftieth anniversary of Fiesta’s 1936 introduction. New colors reflect style and décor design changes, much as Fiesta’s original run did. The first colors in Fiesta’s reintroduced line were rose, black, cobalt blue, white, and apricot. The reintroduction happened just as I bought my own home and went shopping for dinnerware, so many of the pieces in my cupboard today are apricot colored, although I’ve also got pieces in some of the newer colors like red, tangerine, Kelly green. Homer Laughlin Company introduces and discontinues Fiesta colors (like this year’s introduction of Marigold in a limited 75-week run to celebrate the line’s 75th anniversary) to spur the collectors’ market and insure the line’s continued popularity. 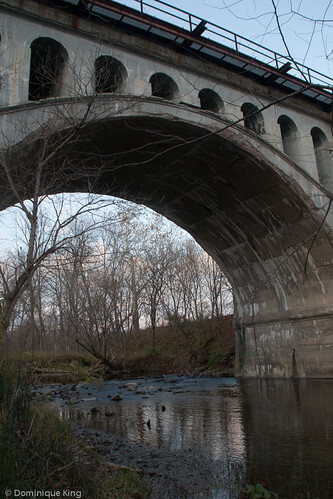 Local clay also figured prominently in another important 1800s Ohio industry. Read about Ohio’s Hocking Valley brick makers and more about working with early kilns at Ohio’s Hocking Valley bricks pave the nation. Want to learn more about Fiesta and collecting vintage pieces? Check out Warman’s Fiesta: Identification and Price Guide by Glen Victorey or Collector’s Encyclopedia of Fiesta by Bob Huxford and Sharon Huxford.